The final stage in the growing process if you can call it that is drying the marijuana plants. You could simply grab the harvested plant and hang it up but you will get a much better result if you follow some of the instructions below. You can also check out marijuana pictures to see how others have dried their plants. To be sure your marijuana reaches its full potential you should make sure that you dry it properly. Chemical changes occur during drying that will increase the active ingredients. Bad drying however will decrease the active ingredients thc. Ideally the drying area should be around room temperature (low 70`s)and in darkness. As about 75% of the weight of fresh cut cannabis is water ventilation and air circulation are also important to avoid any problems with mould. Mould can turn a plant to black sludge over night. Make sure you open up big colas to check for grey moulds. Any plants found to be going mouldy should be separated from the rest, trimmed of the mould and quick dried. 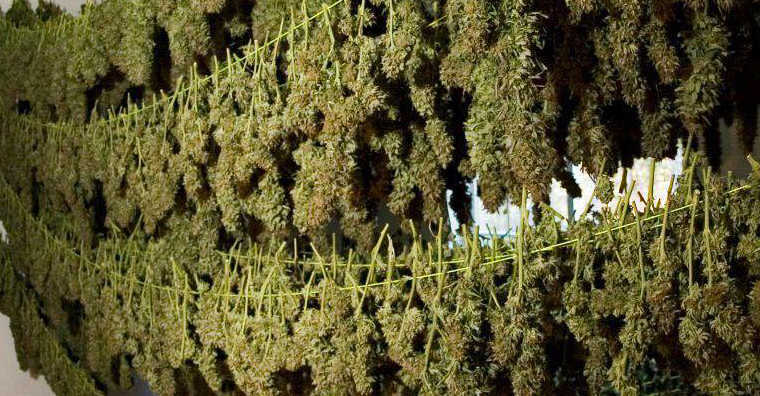 One of the simplest methods of drying marijuanais to hang plants from a string, this allows air circulation and keeps the buds from touching anything. Sticky t.h.c. laden glands are easily dislodged so avoid too much contact with your plants. The first 3 or 4 days are the most crucial. Marijuana dried any quicker than this will often be harsh, brittle and of inferior quality to the same bud dried a bit more slowly. After 3 or 4 days you can speed up the drying if you really need to. Sometimes large colas are damp in the middle whilst brittle dry on the outside. Place these buds in plastic bags over night to even out the moisture content. Dried cannabis should be firm, springy and should not crumble when handled. When your Marijuana has dried to an acceptable level it can be stored in dark, air tight containers. Many people freeze their cannabis or keep it in the refrigerator, this helps prolong the freshness the same way it does with other herbs. Curing is a longer more drawn out drying period. The chemical changes that occur during drying are allowed to continue further so that the taste, strength and appearance of the cannabis is altered even more.